NOW Eggwhite Protein contains <1 g of fat and carbohydrates per serving and rates as one of the highest quality proteins available when using the PDCAAS. A good mix of proteins from different sources provides the best results, and an excellent addition to any protein supplementation program. Egg protein stimulates muscle growth and has been demonstrated to increase muscle protein synthesis in university studies. These effects likely result from the high concentration of the amino acid Leucine, the major amino acid responsible for stimulating the synthesis of muscle protein after a meal. Egg contains 10% to 20% more leucine than other protein sources, but it provides your body with all the amino acids it needs for growth and repair. Suggested Use: As a high-protein, low-fat food, add 1/4 cup. 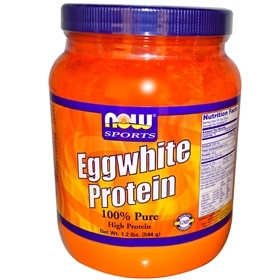 Eggwhite Protein to 12 oz of milk or other liquid. This powder can also be used in cooking recipes by mixing two tablespoons of powder with six tablespoons of water to equal two egg whites.